Janice Bradley started her track and field career 15 years ago. She has 20 more to reach her goal. “I’m looking forward to doing the 100-meter dash when I’m 100,” Bradley said. No need to do the math. Bradley is proud to say she is 80. And atop many of the leaderboards. A couple weeks ago, Bradley won nine events at the Washington State Senior Games in Tumwater. 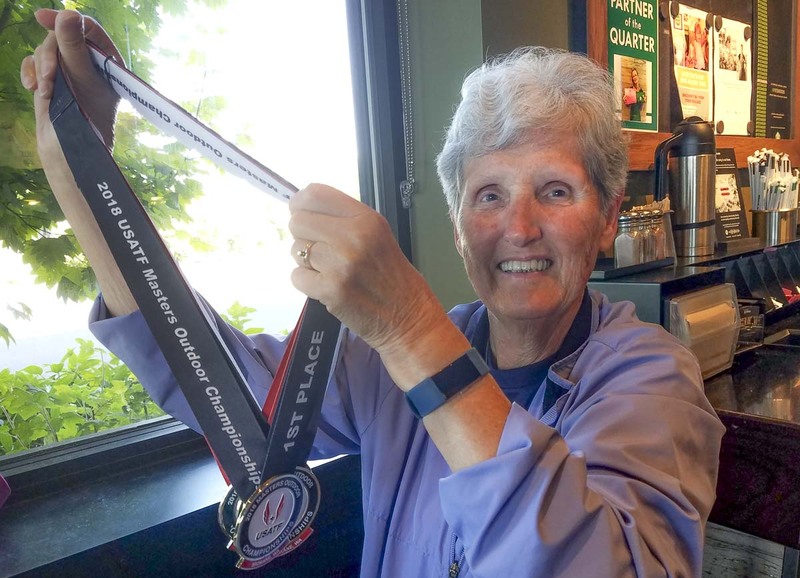 Last week, she earned six medals in the USATF Masters Outdoor Championships in Spokane, including two gold medals, in the 80-84 age group. Bradley, who has lived in Battle Ground since 1977, is proof that it is never too late to become an athlete. Always athletic growing up in Illinois, she never competed in any organized sport. This was long before Title IX, long before women had so many opportunities in sports. She was inspired by her children. At 45, Bradley joined a soccer team. At 65, she saw a story highlighting senior games for track and field. She decided to try something new. Apparently, she said, she was a natural. She was asked to throw the discus. “I didn’t even know I could hold it,” she recalled. After a brief primer on the basic form, she let one fly. “Oh, I think you can make nationals,” she remembers her coach saying that day. This weekend, Janice will be in Seattle for the National Masters Throws Championships. Bradley enjoys the social aspect of the sport, getting to know all the other athletes. Competing also gives her and her husband of 53 years something else to share. Robert is an athlete, too, an accomplished squash player. Janice always wears a crucifix during her competitions, too. Of course, she also has fun competing, making up for a lot of years when she was not in organized sports. She celebrates birthdays because they make her one year closer to the next age group. Her track and field season is just about to conclude for 2018, but she says she will exercise daily to prepare for 2019. Competition keeps her going, in more ways than one. “If you sit down to become a couch potato, you’re not going to live very long,” she said.